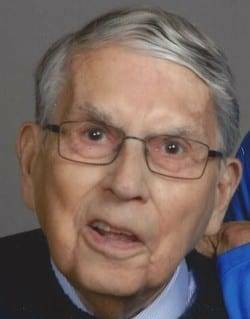 Dale D. Weldy, age 89 years of Archbold, OH, passed away on March 13, 2019, at CHP Defiance Area in-patient Hospice. He was born June 11, 1929, on the family dairy farm in Wakarusa, IN. Dale was the son of Samuel R. and Alva E. (Loucks) Weldy. He worked on the farm and travelled the country showing registered Guernsey cattle. Dale graduated from Wakarusa High School and attended Goshen College. On March 22, 1953, he married Helen Eicher Weldy and they were the parents of two children: Kirsten and Kim. Dale and Helen were members of Zion Mennonite Church in Archbold. For most of his life, Dale worked as a car salesman in Archbold. He enjoyed meeting people. Music was an important part of Dale’s family. His mother, father, brothers, and sister sang together. During and after college, Dale sang in quartets, the church choir and other musical groups and productions. Singing was one of his greatest pleasures in life especially singing solos and singing in conjunction with the Toledo Symphony Orchestra. Dale was preceded in death by his parents, his brother, Maurice Weldy, and sister, Miriam Weldy. He is survived by his wife, Helen; daughter Kirsten (David) Meyer; son, Kim (Karin) Weldy; and special daughter Peggy (Todd) Lightner. Grandchildren and their families include: Karah (Weldy) and Justin Ehrhardt, Brice and Tracy (Weiler) Meyer, Kirk and Leah (Gautsche) Weldy. Great-grandchildren include Kiptyn, Kyla, and Kamryn Weldy; Barrett and Violet Meyer; Corey Ehrhardt: Aaron Lightner and Ashley (Jordan) Forsythe. Dale is also survived by a brother, Keith Weldy, nieces, and nephews. Visitation will be Monday, March 25, at Zion Mennonite Church, Archbold, OH, from 3:00-8:00 PM. The memorial service will be held at the church on Tuesday, March 26, at 4:30 PM. Burial will precede the service. Memorials should be made to CHP Home Care and Hospice or to the Zion Church Choir. Be the first to comment on "Dale Weldy (1929-2019)"